"Pork loin roast - good-looking, lean, and attractively priced (under $25) - makes a memorable, no-fuss meal for holiday entertaining." Roast until a meat thermometer stuck into the center registers 125 to 130 degrees. (Start checking at about 1 1/2 hours.) Remove from oven; raise oven temperature to 400 degrees. Brush loin with pan drippings, return to oven, and continue to roast until the loin is golden brown and a meat thermometer stuck into the center registers 145 degrees F (63 degrees C), about 20 minutes longer. For even more attractive coloring, broil until spotty brown, 3 to 5 minutes. Let roast rest 15 to 20 minutes; transfer to a carving board. Stir juices around pan to loosen brown bits. Pour through a strainer into a small pan, and stir in port, chicken broth and remaining 2 Tbs. of jelly; bring to a simmer. Mix cornstarch with a couple of tablespoons of cold water; whisk into sauce. Simmer until lightly thickened. Slice pork and serve with a little sauce. See how to make sage-rubbed roasted pork with a tangy glaze. 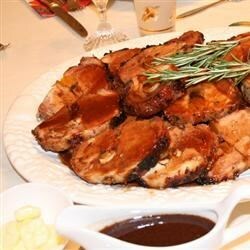 If you opt to roast a portion rather than a whole pork loin, select the more flavorful rib end. A 4-pound roast will serve 8. It was ok. Really fruity. I thought it would be exotic and interesting, and I guess it was- but not something I'd do again. Noone touched the leftovers.